The new trivalent chromium-based TripleHard technology developed by the Finnish company Savroc Oy provides for cost-efficient manufacture of harder and more durable surfaces as compared to the traditional hard chromium plating utilising hexavalent chromium. Moreover, as compared to the hard chromium plating, TripleHard is environmentally friendly and occupationally safe alternative. Due to the carcinogenicity of hexavalent chromium, use thereof will be licence-based within the EU from the year 2017. – Our technology has attracted worldwide interest in a short time, since we have solved the performance problems of trivalent chromium in demanding technical applications such as ball valves, shock absorbers and hydraulic cylinders. The company has filed six patent applications, explains Osmo Jahkola, CEO. Savroc has managed to successfully scale up the process chemistry for trivalent hard chromium plating for industrial production in co-operation with the Spanish company Tecnocrom Industries in case of various applications, for example, valve components, hydraulic cylinders, tubes, and moulds. – We have been a leading company in the coating industry for 55 years, mainly with hard hexavalent chrome and electroless nickel and in our continuous search for alternatives, more efficient and environmentally friendly coating solutions. We believe that the agreement with Savroc will allow us to implement this new technology in our plating lines, says Rafael Fontanals, Tecnocrom’s owner and CEO. Tecnocrom has coated the first industrial-scale batch of cylinder rods using the TripleHard method for the Finnish company Hydroline Oy. 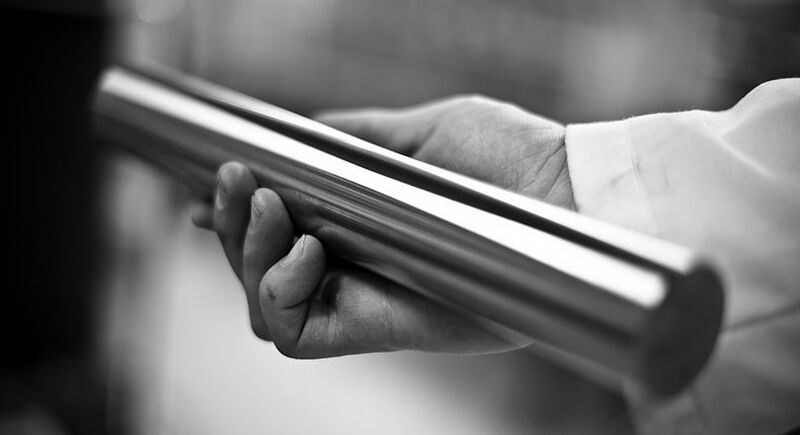 – This new piston rod coating is a revolutionary innovation, which gives Hydroline a significant competitive advantage in the international market. Measured by all technical parameters, TripleHard coating is a significant improvement, and a more environmentally safe solution as compared to current hexavalent chrome coatings. For example, in coating hardness and corrosion resistance, we can achieve over three times better performance, says Manu Leinonen, Hydroline’s Vice President of Design and R&D. – The joint product development with Savroc is a great example of cooperation between a long-term family-owned company and a new start-up, founded by Juha Miettinen and Jussi Räisä in 2012. This demonstrates that even in traditional industry, new innovation can be created through open collaboration, says Mikko Laakkonen, Hydroline’s CEO. Co-operation with Beretta, a leading weapons manufacturer, has also been successful. The company that has been manufacturing weapons for more than 500 years has tested the TripleHard method for the demanding coating of shotgun barrel internal surfaces. – Being a forerunner by taking innovative technologies in use, Beretta has decided to start a project and tests with the target to reach high technical requirements on shotgun components with Savroc’s green technology application, says Andrea Vianello, Supply Chain Director. Savroc on teknologiayhtiö, joka on kehittänyt kolmenarvoiseen kromiin perustuvan ympäristöystävällisen ja työturvallisen pinnoitusmenetelmän vaativiin teknisiin kohteisiin. Savrocin menetelmä on kustannustehokas vaihtoehto nykyisin käytössä olevalle myrkylliselle kovakromaukselle.